COP21 – Should we be celebrating? Following the COP21 Paris climate conference in November last year, Stop Climate Chaos Cymru and the WCIA hosted a debate ‘Good COP? Bad COP?’ in the Temple of Peace, Cardiff on 27 January as a chance to reflect and synthesise the outcome of the Paris Agreement and ask the question – what does this mean for our work here in Wales? The event hosted an excellent range of expert speakers divided onto three panels, all offering unique and insightful responses to their perspective of the successes or shortcomings of the Paris conference. This rich tapestry of voices weaved a mixed response of welcome and challenges that clearly spelt out the need for mild celebration, but with an emphasis that there is still a long way to go in tackling climate change. 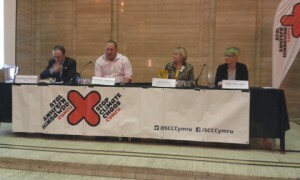 The three panels, made up of a Wales, UK and International focus brought together a range of environmental and development agencies, as well as a of groups and societies all interested in tackling climate change ranging from WWF to Christian Aid Wales; the NFWI (Women’s Institute) to Fair Trade Wales – all offering a unique perspective on the issue. The debate highlighted key concerns around whether the target of 1.5 degrees will be met, Nick Pidgeon, Professor of Environmental Psychology clearly outlined that even if were to cut all emissions today, that due to a lag in global warming we would still exceed that 1.5 limit. But with that said, “Agreements made at COP were a good basis to move forward from, for example the fact that the pledges have to be re-visited every five years by all countries that signed the agreement is real progress”. The impact of climate change on the poorest communities around the globe was clearly emphasised through Christian Aid Wales and Fair Trade Wales who highlighted the impact of a changing climate on farmers and vulnerable communities. Against the backdrop COP21 was a welcome move in the right direction, but not the whole solution to the huge task of tackling global climate change. The evening was a great way to listen to the range of voices covering topics of diet, consumption and technical solutions to tackling climate change, especially here in Wales. So in answer to the question whether it was a good COP or a bad COP, it seems that all voices brought to the table a different verdict on the outcomes of the talks. As SCCC we have been pushing for a #fairclimatedeal, and have worked hard to push climate change onto the political agenda here in Wales. Perhaps we can take stock of the key success that we now have a global agreement offering a turning point for global participation and action to tackle climate change. But is our hard work over now? Clearly it is not, and there is still a long way to go.